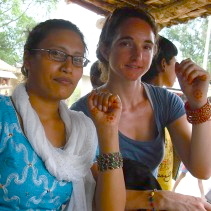 Kate Bollinger (Women’s Reproductive Rights Program – WRRP): Kate’s interest in Nepal began when she studied for a semester in Nepal as an undergraduate. She then went on to study for a Master’s degree in Social and Cultural Anthropology at the University of Oxford. While at Oxford, Kate pursued field research and language study in Sikkim, India and Kathmandu, Nepal. Her research in this area continued as an intern and consultant in the Anthropology Department at the American Museum of Natural History in NYC. Kate has also interned at the Association for Women in Science in Washington DC and the Consortium for Gender, Security, and Human Rights in Boston. At the time of her fellowship, Kate was a graduate student at the Monterey Institute of International Studies (MIIS) studying International Policy Studies with focus on international development and South Asia. After her fellowship, Kate wrote: “I don’t think I’ve seen the level of poverty that I saw in the field. It made me feel extremely privileged. It was great to get experience working in a local organization abroad – something I’d never done before. Also, the skills I gained in the process (interviews, editing, web site development, etc) will be great to carry into future work. I will cook daal bhat more often!" One of the most essential items I’ve acquired in Nepal is my light blue umbrella. A few hours after our arrival in Lahan, it is time to get to work.